When the weather starts to cool down, I get inspired by the flavors of fall. One of my favorites is pumpkin, and the past few weeks, I’ve been on a pumpkin kick. Last week I made these Pumpkin Spice Oatmeal Pecan Cookies, and this weekend, I whipped up this pumpkin pie ice cream, adapted from a Jeni’s Splendid ice cream recipe. Blending all the traditional pumpkin pie flavors into a ice cream base, this recipe brings back warm memories of Thanksgiving. I am not a big pumpkin pie fan; I don’t like the texture, but the texture of this ice cream is fantastic. 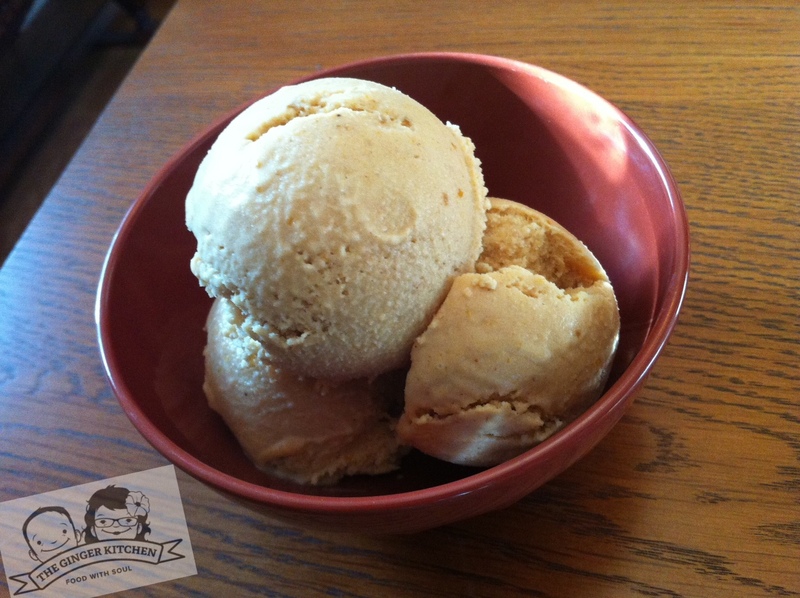 Creamy, smooth, and rich, my pumpkin pie ice cream is a welcome addition to the fall line up. Mix about 2 Tbsp. of the milk with the cornstarch in a small bowl to make a smooth slurry. Whisk the cream cheese and salt in a medium bowl until smooth. Add the pumpkin puree and the honey and whisk until smooth. Comine the remaining milk, half & half, the cream, coconut milk, sugar, corn syrup, and pumpkin pie spice in a saucepan, bring to a rolling boil medium-high heat, and boil for 4 minutes. Remove from the heat and gradually whisk in the cornstarch slurry. Bring the mixture back to a boil over medium-high heat and cook, stirring with a heatproof spatula, until slightly thickened, about 1 minute. Remove from the heat. Gradually whisk the hot milk mixture into the pumpkin mixture until smooth. Cover and place in the coldest part of the freezer until cold. Pour the ice cream base into the frozen canister and spin until thick and creamy. How much does this recipe make? I want to make sure it can fit in my ice cream maker…. Hi Caitlyn, Great question. It makes 2 quarts.